When a little boy from Yakima asked the librarian for books about "kids like us," she couldn't think of any. So Beverly Cleary decided to write them herself. Beverly Cleary once received a fan letter from a dying man. He was 56 years old, retired and "very weak," he wrote. "That's why I have such sloppy handwriting." But the penmanship wasn't so much sloppy as childish, Cleary recalls. "And then the last line was, 'P.S. That is all a lie.'" She wrote back and told the boy he had a fantastic imagination. Cleary, '39, is known for her phenomenal memory, her flawless eye for detail and ear for dialogue, her exquisite timing and her economical prose. Each of her 30-plus children's books is a master class in effective storytelling. But the quality that perhaps most distinguishes her is a willingness to let children be who they are. When Ramona Quimby names her doll Chevrolet because she thinks it's a beautiful word, or squeezes an entire economy-size tube of toothpaste into the bathroom sink because she's frustrated, or sweats through a school day because she's wearing her pajamas under her clothes, the reader, young or old, can relate. "As a child, I disliked books in which children learned to be 'better' children," Cleary says in a telephone interview from her Carmel, Calif., home. For her lifelong devotion to children, and for the devotion she has inspired in three generations, Cleary was named the University of Washington's 2008 Alumna Summa Laude Dignata-the alumna of the year. It's the highest honor the UW bestows upon its graduates, and she is its 68th recipient. 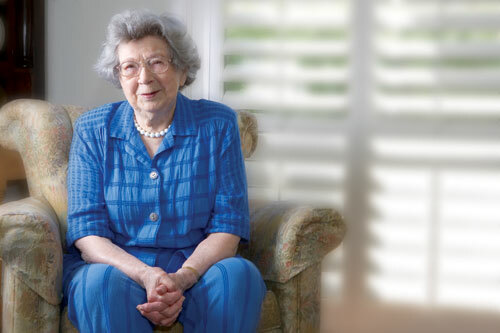 Now 92, Cleary did not attend the June 12 awards ceremony, but in a video message she thanked the University for helping her to become a children's author, and for understanding "the importance to young readers of books that they can read with pleasure." The pleasures of reading weren't always apparent to Cleary. Born in 1916 to Lloyd and Mable Bunn, she spent her early years on a farm outside the tiny town of Yamhill, Oregon, where the orchards and meadows proved more diverting than storybooks. When the family moved to Portland and Cleary entered the first grade, her attitude toward reading changed from indifference to outright distaste. The rules made no sense to her, and the required texts were tedious. Ruth, John and Rover never did anything interesting (and what was that 'h' doing in 'John'?). Worst of all, her teacher was cruel-she would whack Cleary on the knuckles with a cane for letting her mind wander. When Cleary returned from a bout of smallpox, which she actually preferred to the first grade, she found herself hopelessly behind the other children and relegated to the "slow" reading circle. Most of these struggles would one day be faced by Cleary's fictional avatar, Ramona. One rainy afternoon in her third-grade year, Cleary opened a book called The Dutch Twins and found herself reading for fun. It was a revelation. "From that moment on," she says, "I was a reader." She got her first tantalizing taste of creative writing when her seventh-grade teacher assigned an essay about a favorite literary character. Unable to choose just one, Cleary wrote a short story in which a girl visited Bookland and talked to Tom Sawyer, Peter Pan and Judy from Daddy-Long-Legs. "As rain beat against the windows, a feeling of peace came over me as I wrote far beyond the required length of the essay," Cleary recalls in A Girl from Yamhill, the first of her two autobiographies. "I had discovered the pleasure of writing, and to this day, whenever it rains, I feel the urge to write." The next day, the teacher read the story aloud. "When Beverly grows up," she told the class, "she should write children's books." Cleary's practical-minded mother said that if she wanted to be a writer, she'd need to support herself somehow. Cleary thought of the happy hours she'd spent in the Rose City Branch Library and concluded that librarianship was for her. "My career decision was lightly made," she writes in A Girl from Yamhill. Yet she never reconsidered it. After graduating from Grant High School in 1934, she attended Chaffee Junior College in California for two years, then the University of California, Berkeley, where she majored in English with an eye toward library school. While there, she began spending a lot of time with a handsome young man named Clarence Cleary. Lloyd and Mable disapproved of their daughter keeping company with a Catholic, but Beverly was strong-willed and in love. She and Clarence eloped in September of 1940-a marriage that would last until Clarence's death in 2004. The stories of Beverly Cleary have proven timeless, but the illustrations that accompany them have had to change with the times. In the 58 years since Ramona Quimby first stomped onto the scene, she has undergone some extreme makeovers. From left to right, here's Ramona rendered by Louis Darling in 1955, Alan Tiegreen in 1979, and Tracy Dockray in 2001. In 1938, Cleary moved to Seattle to begin her studies at the UW's School of Librarianship. She lived north of campus in a small, furnished room with a card table for a desk, and walked a mile every day to her classes in Suzzallo Library. "That was during the darkest Depression," Cleary recalls, "and I was living on $35 a month, which was not easy." It was an uncertain time and an austere life, one she vividly evokes in her second autobiography, My Own Two Feet: "Afternoons most of us studied at our desks until three o'clock, when we were granted the privileges of the faculty room, where we could have tea and two Ritz crackers for 2 cents. I looked forward to that tea and those crackers." But Cleary says she learned a lot from her UW professors, particularly Siri Andrews, who taught children's librarianship. Andrews' course in storytelling, Cleary says, was "invaluable to me ... because writing for children is storytelling." Cleary was relieved to be offered a job not long after graduation at a public library in Yakima. It was there that she had a fateful encounter with a grubby little boy who wanted to know where to find all the books "about kids like us." A credentialed children's librarian, she had no answer. And she recalled her own childhood search for books about the sorts of kids who lived in her neighbor-hood-ordinary kids with ordinary kids' concerns, like schoolwork and skinned knees and lost dogs and thought, I'll write them myself. But it would take another decade for her to realize that ambition. Wanting to write a book, she realized, was not the same thing as having a book she wanted to write. She married Clarence and joined him in California. In 1948 they bought a small house in the Berkeley hills. When Cleary discovered a ream of unused typing paper in the linen closet, she took it as a sign. She moved an old kitchen table into the spare bedroom, sat down and tapped out the sentence, "Henry Huggins was in the third grade." She gave Henry a home on Klickitat Street in Portland, not far from the home she'd grown up in, and set about populating the neighborhood. A few months later, she'd finished a first draft of Henry Huggins, the story of a boy who takes in a stray dog. The book contains almost all of Cleary's signature characters: the well-meaning everyboy Henry, his lovable but mischievous mutt Ribsy, the responsible neighbor girl Beezus Quimby and her tagalong sister, Ramona. It was accepted by the first publisher Cleary sent it to, Morrow, and published in 1950. Although Cleary had introduced Ramona simply to give one of the characters a sibling, she soon learned that the stubborn, meddlesome, sensitive little girl was going to insinuate herself into every story she could. By 1955 she was a title character. Ramona seemed to give expression to a side of Cleary's personality that had never found an outlet before. Cleary was always a quiet, respectful child, she explains. "But I had Ramona-like thoughts!" Ramona's complexity was something unusual in children's literature. Seen through the eyes of any other character, she could be a real nuisance. But when Cleary wrote from Ramona's point of view, all of the little girl's actions made perfect sense. Cleary also broke new ground with her frankness about family life. Ramona's home is essentially a happy one, but the happiness has a fragility to it. Her father finds and loses jobs. When her parents quarrel, there's a barely suppressed biterneness that can make the reader wince. "Those books don't seem so radical now, but they were when she was writing them," says Eliza Dresang, the incoming Beverly Cleary Professor in Children and Youth Services at the UW Information School. Dresang has spent the past decade studying the ways digital technology is transforming children's books. "One of the things I began noticing" she says, "was that in an age when kids have more access to information, the books are changing. They're expanding in terms of the topics they'll cover, the honesty, the accuracy, the ability to portray real-life children. Well, Beverly Cleary was doing that 50 year ago." Few of today's authors can match Cleary's achievement, Dresang adds, because few, if any, have her combination of gifts. She really listens to children, and can pluck the most memorable phrases from their cacophonous conversations. And her own memory is a marvel. "I'm just plain lucky that way," Cleary confesses. "I remember every blade of grass from my childhood." When her twins, Malcolm and Marianne, were born in 1955, Cleary inherited yet another rich source of material for her stories. Keith, the human hero of The Mouse and the Motorcycle, bears more than a passing resemblance to Malcolm. A claim can be made for Cleary as America's best-loved children's author. Her publisher estimates she receives 100 fan letters a day. She has won the Newbery Medal and the National Medal of Art, and a coalition of educators and librarians recently established a nationwide day of reading on her birthday, April 12. A former children's librarian herself, Dresang has seen that love firsthand. She tells the story of a visit she paid last April to Schaumburg Elementary in New Orleans, where she had been helping schools rebuild libraries lost in Hurricane Katrina. "I think it was a 98 percent free- or reduced-lunch school, very poor, she says. "I walked in, and on the glass window that led into the library, in huge letters, it said, 'Happy Birthday Mrs. Cleary.'" Eric McHenry is co-editor of Columns.